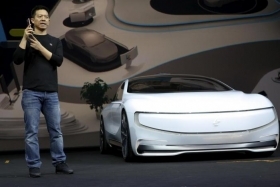 Jia Yueting, co-founder and head of Le Holdings Co Ltd, also known as LeEco and formerly as LeTV, unveiled an all-electric battery concept car called LeSEE in Beijing in April. BEIJING -- China’s Le Holdings Co. has raised $1.08 billion to develop its electric sports car that has drawn comparisons to the Batmobile, the latest in a series of alternative energy vehicle investments even as the industry is set for a Chinese government shake-up. The Beijing-based company, also known as LeEco, has attracted a group of Chinese investors for the project’s initial funding, including Legend Holdings Corp., Yingda Capital Management Co. and China Minsheng Trust, it said in a statement on Tuesday. LeEco joins a line of startups to have announced fundraising completions as the industry hangs on the verge of a major shake-out. The government is imposing stricter technology standards and considering limiting the number of manufacturers to 10. WM Motor, founded by Freeman Shen, former top executive at Volvo parent Zhejiang Geely Holding Group Co. and Fiat Chrysler Automobiles, said last month it was seeking to raise $1 billion to prepare it to challenge Tesla Motors Inc.
LeEco’s billionaire founder Jia Yueting, who built his wealth from video platform Leshi Internet Information & Technology Corp., said in April financing had been the weakest link for the electric-car project. NextEV Inc., another Chinese electric-car startup with ambitions of unseating Tesla, last year raised funds from investors including Sequoia Capital and Joy Capital as part of plans to develop affordable, connected green cars.